In an existing installation (such as an older home built in the 1950s), it is considered Code-compliant for the kitchen range or the clothes dryer to be installed using a 3-wire cord and plug. However, in new construction the installation of kitchen ranges and clothes dryers requires a 4-wire cord and plug. 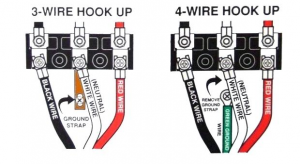 The 4th wire in that cord and plug configuration is an equipment grounding conductor. This equipment grounding conductor is the missing wire in the older 3-wire configurations. 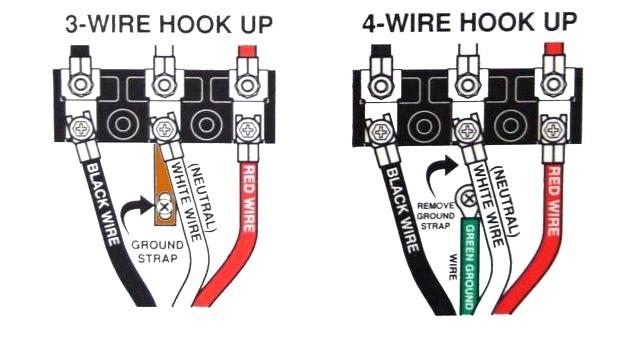 In the older style 3-wire cord and plug setup, the neutral did two jobs: (1) it carried the return current back to the source for the aforementioned 120 Volt appliance loads, and, (2) it was connected to the metal frame and metal housing of that same appliance, so that in the case of a short to ground condition, the circuit-breaker at the panel would trip. If the Neutral in that 3-wire configuration wasn’t connected to the metal frame and housing of the appliance, the circuit-breaker protecting the appliance would not trip during a short to ground condition. For example: if a hot wire within a clothes dryer broke loose from the heater element due to vibration, and then made contact with the metal housing of the dryer, that metal housing would become energized and would remain energized indefinitely, as long as there was no path for that shorted current to travel to get back to its source. This energized metal would then no doubt shock someone who came into contact with it, if they were grounded; such as a person with bare feet on a basement floor. The takeaway from this is that without a return path for current to flow, that is connected to the exposed metal of an appliance, applied voltage to that metal during any kind of fault condition would just remain on that metal. That is why even in the 3-wire cord configuration, a return path in the form of the neutral wire was attached to the exposed metal. In the 4-wire cord and plug configuration, the equipment grounding conductor now serves to do one of the jobs that the neutral was doing previously in the old 3-wire setup. The equipment grounding conductor is now the conductor that is attached to the metal frame and housing of the appliance. It has the sole responsibility of carrying back any fault current on that metal during a short to ground condition. The neutral in that cord is no longer connected to the metal frame and housing, and indeed cannot be, as it is prohibited by the NEC during new construction. The reason the neutral wire of an appliance is no longer permitted to carry fault current back to the source, (which means it can no longer be attached to the metal frame and housing of an appliance), is because it was determined long ago that attaching the exposed metal of an appliance to a neutral conductor that is carrying current is a bad idea. That moving current is always looking for the path of least resistance back to its source, and under the right circumstances, such as a homeowner standing barefoot on a wet basement floor, that current on the exposed metal of that appliance may just briefly decide that a human being in contact with that exposed metal is that path of least resistance. Modern clothes dryers often have a bonding strap in place that connects the metal housing of the dryer to the neutral lug of the cord attachment terminals, in case the installer is using the 3-wire cord method. In a modern home, the dryer installer just disconnects and discards that bonding strap, so the neutral and exposed metal of the dryer are not connected. Why #6 Grounding Electrode Conductor?